The recent US government shutdown has had many serious effects. One interesting effect is that it allowed a group of elephant seals to take over a beach in a national park. The 35-day shutdown, which ended in late January, was started because President Trump wanted $5.7 billion to build a wall between the US and Mexico, but Congress did not agree. So Mr. Trump refused to sign any spending bills that Congress suggested. Without the spending bills, the government did not have the money it needed to stay open. In the end, the shutdown became too unpopular, and Mr. Trump ended it without getting any money for his wall. The 35-day shutdown was started because President Trump wanted a $5.7 billion wall and Congress did not. Mr. Trump refused to sign any spending bills that Congress suggested. Without the spending bills, the government did not have the money it needed to stay open. 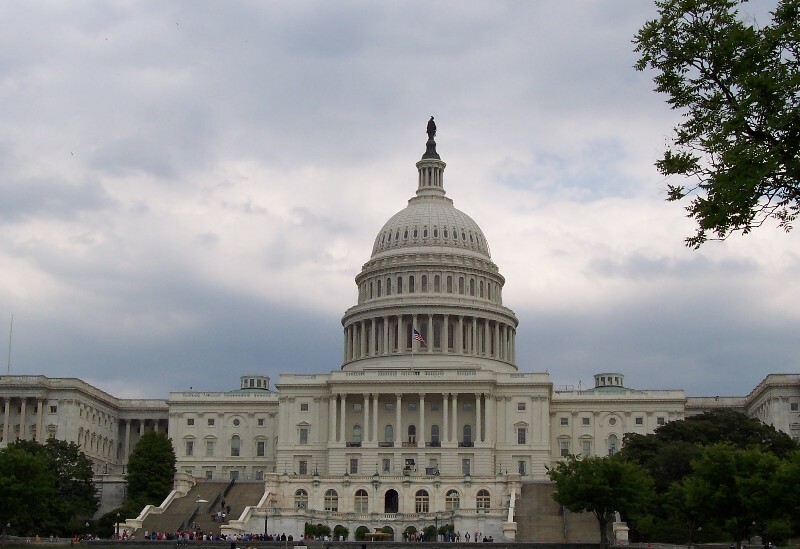 This picture shows the US Congress building. The shutdown had many serious effects. Around 800,000 people who worked for the US government did not get paid for over a month. Many of them were forced to work without pay. Many government offices and national parks were closed. Because there were no workers watching over the parks, many parks were damaged by careless visitors. At Joshua Tree National Park, some visitors broke the rules and drove in places that were supposed to be protected. Park workers say that it could take a long time for the park to recover from the damage. At least one 300-year-old tree was killed. Because there were no workers watching over the parks, many parks were damaged by careless visitors. 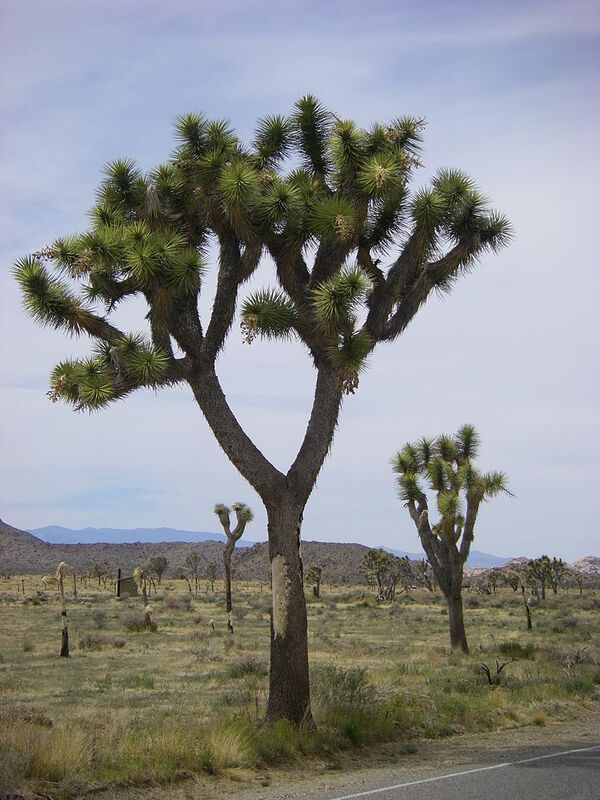 At Joshua Tree National Park, at least one 300-year-old tree was killed. At Drakes Beach in the Point Reyes National Seashore in California, visitors also knocked over a fence and went places they weren’t expected. But it’s not such a big deal, because these visitors were elephant seals. Elephant seals are larger than most seals. They have no ears and short front fins, which makes it hard for them to get around on land. Elephant seals are common along the Point Reyes National Seashore. 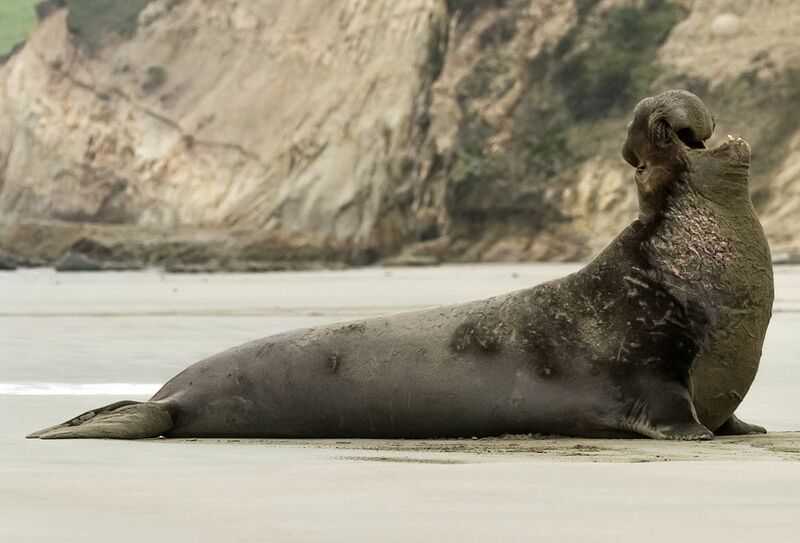 There is a place near Drakes Beach called Chimney Rock, which usually has a large group of elephant seals. Elephant seals are larger than most seals. They have no ears and short front fins, which makes it hard for them to get around on land. Male elephant seals, called “bulls”, can weigh as much as 4,500 pounds (2040 kilograms). But Drakes Beach is mainly enjoyed by humans. Over a million people visit it every year. Sometimes elephant seals show up, but workers are normally able to get them to move on by shaking a large plastic sheet called a tarp. The noise and movement of the tarp usually make the seals look for another place to rest. 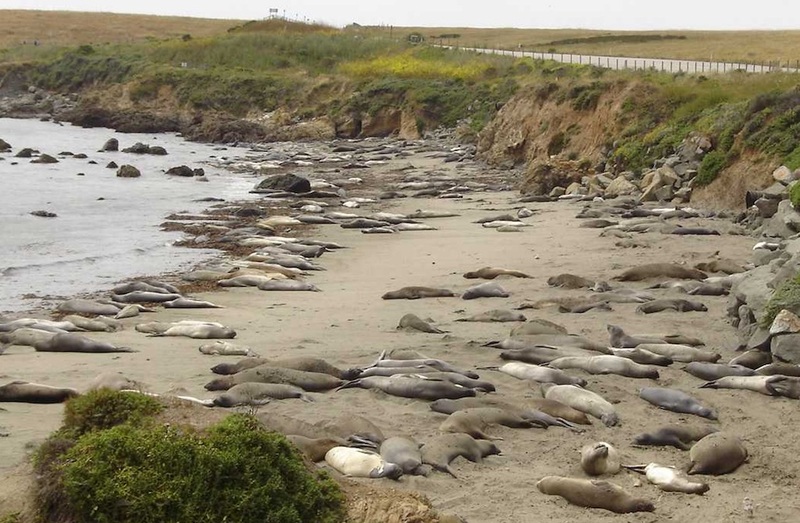 During the shutdown, when there were no workers at the park, about 50 or 60 elephant seals began living on Drakes Beach. This photo shows another group of elephant seals in California, near Big Sur. But during the shutdown, there were no workers there to shake tarps. Chimney Rock was damaged by a storm, and so about 50 or 60 elephant seals began living on Drakes Beach. There were even reports of two adult male seals, called “bulls”, in the parking lot. Bull elephant seals can weigh as much as 4,500 pounds (2040 kilograms). Winter is the season when elephant seals have babies. So far, about 35 babies have been born. That means that there are now about 100 elephant seals on Drakes Beach. Winter is the season when elephant seals have babies. 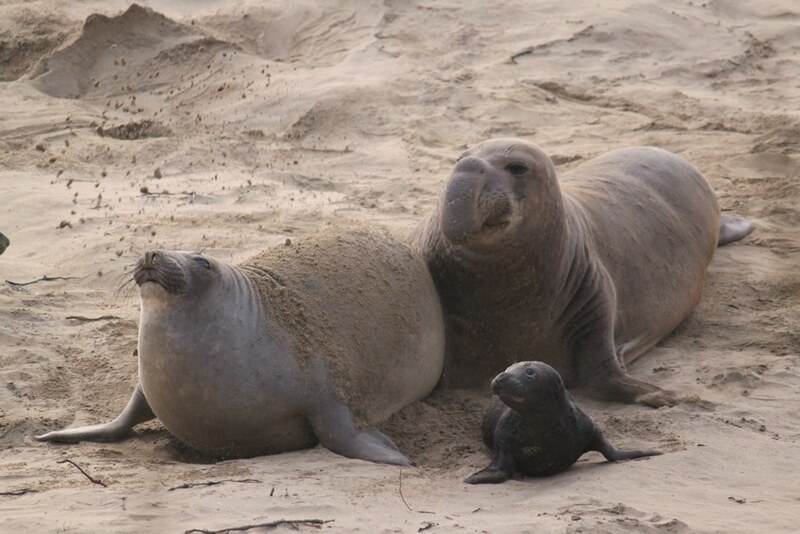 So far, about 35 babies have been born, so there are now about 100 elephant seals on Drakes Beach. This picture shows a male (right rear), a female, and a baby. There are no plans to try to remove the seals. Park workers are trying to come up with a new plan to protect the beach and the seals while also keeping park visitors happy. The US government has been shut down since December 21 because President Trump and Congress don’t agree about whether the US should spend money to build a wall between the US and Mexico. 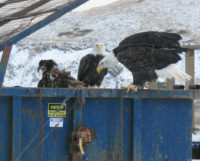 The county government near Seattle, Washington is struggling with an unusual problem: bald eagles are taking trash from a garbage dump and dropping it in the yards of people who live nearby. 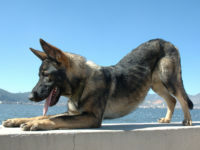 China has used DNA to make a copy of a police dog famous for its abilities. The company that did the work hopes the clone will be as talented as the original dog, which they called the “Sherlock Holmes of police dogs”. Two different groups of scientists are looking at the way mice talk to each other, but they are doing this in very different ways. Both sets of scientists are learning amazing new information about mice. In recent weeks scientists have found two very different animals that have not been seen in dozens of years – a very rare tortoise and the world’s largest bee. Why Do Zebras Have Stripes? To Confuse Flies. 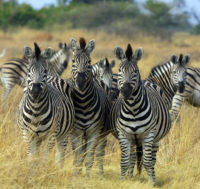 Scientists have long wondered why zebras have stripes. A recent study seems to show an unexpected reason – to confuse flies so that it’s hard for them to land. 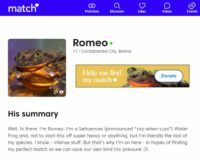 Humans are not the only ones who use dating sites and apps to find a mate. Frogs and cows are also finding partners through creative use of technology.